The North Myrtle Beach rentals at this North Myrtle Beach resort are incredible. They are so spacious and designed to accommodate large numbers of people. Choose between a six-bedroom, five-bath condo in North Myrtle Beach, SC that sleeps anywhere between 16 and 21 people or opt for the big North Myrtle Beach condominium at Atlantis Villas. It has eight bedrooms and seven baths and can sleep up to 26 people. With so much room for so many people, these North Myrtle Beach condos are ideal for golf foursomes to bring their spouses and for multiple families to vacation together at the beach. In addition to the many bedrooms each of these North Myrtle Beach condos features, there is a long list of amenities in each of these condos in North Myrtle Beach, too. This North Myrtle Beach resort features a well equipped kitchen in each condominium rental that boasts cookware, dishes and utensils. These kitchens also have a dishwasher, microwave, full-size appliance and a double refrigerator to better suit a large number of condominium guests. There is a washing machine and clothes dryer in each North Myrtle Beach vacation rental that will likely prove to be most convenient. You will also find numerous televisions and DVD players in each of these condos in North Myrtle Beach, South Carolina. Internet is available in some of the North Myrtle Beach rentals and sometimes it is wireless. Many of the North Myrtle Beach rentals at Atlantis Villas have a game room where you might find a pool table. What a terrific way to relax in the evenings. Play billiards with your family in the comfort and privacy of your ocean view North Myrtle Beach rental. There are ceiling fans scattered throughout these North Myrtle Beach condominiums, too. There are sleeper sofas in each these North Myrtle Beach rentals. 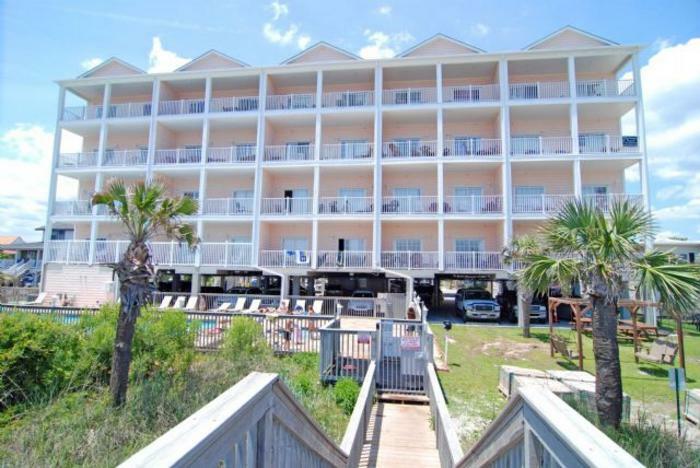 Many of the bedrooms in each of these North Myrtle Beach vacation rentals open to the balcony. There are at least two levels of ocean view balconies in each unit at Atlantis Villas as each North Myrtle Beach rental is spread out on at least two floors. Covered parking on the ground level and a centrally located elevator with stairs on either end of this North Myrtle Beach resort make it easy for your family to reach the interior hallways of this North Myrtle Beach resort that lead to your vacation condominium. On the ground level at this oceanfront North Myrtle Beach resort is a sun deck with a swimming pool that is heated part of the year. Relax on the poolside lounge chairs and take a refreshing dip in the sparkling blue swimming pool on warm sunny days. The views are nice and relaxing while the water is welcoming. After playing 18 holes of Myrtle Beach golf you might want to ease your muscles into the hot water of the Atlantis Villas hot tub. It is adjacent to the pool and just steps away from the Atlantic Ocean. The fact that this North Myrtle Beach resort is right on the oceanfront makes it a dream because the white sandy beaches are what a North Myrtle Beach vacation is all about. Your luxurious North Myrtle Beach vacation rental at this North Myrtle Beach resort puts your family, friends or golf buddies steps away from the glorious ocean.